Richmond Park horse riders and the local community have pulled together to raise major funds to help improve the parks' horse rides. Having received a reduction in public funding over the last couple of years, The Royal Parks is increasingly working through partnerships to find new ways to generate income to maintain and conserve the parks. With an annual operating budget of £32.4 million, The Royal Parks is now tasked with raising just over half that amount themselves each year. With this in mind, the local horse riders have worked together to help fund and bring forward the much needed work to the horse rides which were in a state of disrepair. Approximately 2.5 kilometres of horse rides have been restored with the latest stretch near Martin's Pond. Previously, the rides were so worn that rain would flow down them adding to the erosion and, occasionally, making them impassable in winter. Work has recently finished to raise and resurface the rides so that they can shed water, keeping the new riding surface from being washed away. Thanks to large donations arranged through two private individual park lovers, the worst of the rides have been restored. Representatives from the park riders have agreed a fair and affordable annual donation scheme to raise a further £10k p.a. to maintain their facilities. Adam Curtis, Richmond Park Assistant Manager said, "We are so very grateful to the local riders and community for their generosity to restore these wonderful horse rides. 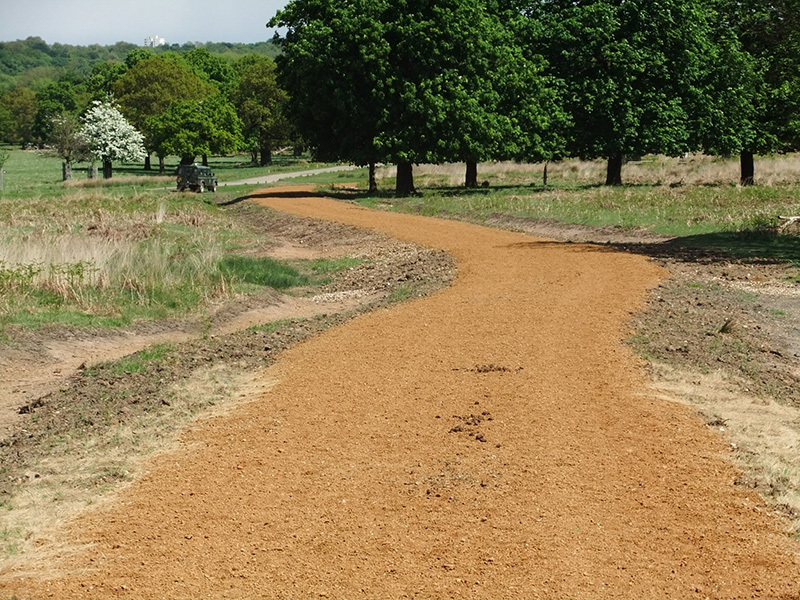 "Their collective contribution will not only help The Royal Parks to further their maintenance budgets but the much needed funds will help to further improve the rides, providing an excellent riding experience in Richmond Park. A true sign of community spirit in these difficult times!"